It was a beautiful winter week here at the Rawles Ranch, with mostly cold and clear or partly-cloudy skies. This coming week is expected to be substantially warmer, with highs in the mid-30s. Lily will be sad to see her good skiing powder snow turn to slush. She’ll soon need to turn her attention to sprouting our greenhouse seedlings. I did some snowshoeing this week. I got down to the the Unnamed River that runs through the back of the ranch, on Tuesday, March 5th. I was surprised to see that the river was mostly frozen over. In my 12+ years here at the ranch, this is the most ice that I’ve seen on the river in the month of March. Thanks for that “Global Warming”, Al Gore! Although I also have some larger snowshoes, my current favorites are what are commonly called modified bear paws. They measure about 9″ x 30″. With any that are any longer, I have difficulty on steep hillsides, and/or in dense woods. And I’ve tried using smaller ones. With those, I sink in too deep, and that is too tiring for long hikes. I’ve found that there is a requisite minimum surface area, especially with the extra weight of carrying a pack. I also often use a pair of very lightweight white ski poles when snowshoeing. Those are particularly important when carrying a pack, for balance. I also got plenty of exercise this week, shoveling snow from “the usual”: outdoor steps, in front of various outbuilding doors, the trail around our house, and the gate out at the county road. Because we have a blade style plow rather than a rotary plow, the process of plowing seems to create more shoveling work around that gate. Oh well, it is all good exercise. I had planned to go to a gun show last Friday, but the weather turned bad. But no worries, I have another show planned for late March. There, I will be on the prowl for some private party purchases, namely: serialized SIG P320 trigger group modules, AR-15 lowers, and AR-10 lowers. Perhaps I can find some complete uppers, to match. But recently I’ve been finding those more inexpensively available via mail order. I buy a lot of my uppers from Palmetto State Armory. Their parts selection and build quality are quite good and their prices are amazing. And of course while at the show I’ll be looking for a few nice pre-1899 cartridge guns. Hopefully, my grandchildren will appreciate inheriting them. This past week I also took advantage of the big “Freedom Fuel” rebate sale, and ordered some Federal brand 5.56mm M193 ball ammo at $299 per thousand from Natchez Shooters Supplies — with a further 5 cents per round factory rebate. They are one of our affiliate advertisers. 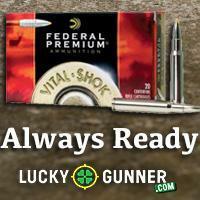 BTW, you can get in on teh Federal ammo deal if you use Promo Code FS190309. Their free shipping offer ends at midnight on March 10th, 2019. A man can never have too much ammo. Especially a grandfather with several grand-kids that need to be supplied. For me, it was a week focused on schooling the girls, researching current events, studying the Word, Hebrew Language, keeping us well fed, and keeping our home well-organized and clean. Miss Eloise wishes to graduate this year, so it’s crunch time for her until the end of April. She needs steady encouragement to keep on keeping on it. I froze four quarts of chicken broth and one quart of chicken soup left over from a large chicken that I had boiled down and made into a soup. From a quart of frozen apple nectar left over from making apple sauce last fall, I mixed it with a cup of honey and boiled it down to make a cup of apple butter to spread on bread. Yum! Lately, I’ve also have been making a lot of gluten and dairy free fruit crisps with our frozen berries, rhubarb, and dried apples. Another Yum! I have been using/experimenting with the top of our wood stove much more often for slow cooking and warming up soups and stews. It has a soap stone top and is actually conducting heat much better than I thought it would. I am finding this to be a fun way of cooking some of our meals. I experimented with cooking a very thin unleavened bread on it in our cast iron skillet. The bread was made with 2 cups of almond flour, about a half cup of coconut cream and some salt and some water to moisten the dough. I mashed the dough very thinly and put it on the skillet and cooked it on the wood stove, flipping it every ten minutes for about 45 minutes. It was quite hard (Almond Hardtack?) and tasted okay with honey.. But it was nothing major to write home about. One of our freezers is beginning to become emptier. Soon we will be transferring what left in there to our other freezer and thawing it and cleaning it, to ready it for this coming summer’s harvest. The kids and I skied only once this week for an hour and a half, and we walked for an hour. You know some weeks I just get tired/not in the mood to play/don’t feel like exercising as much as I should and then it’s hard to get the kids out, too. Also, the beginning of the week was very cold. My body is properly covered and can handle the cold, but I don’t like covering my face…which cannot handle that kind of cold when there is any amount of wind. Then the snow warmed up and was that in between snow of wet/cold that forms ice on the bottom of the skis…Not pleasant. When Jim went snowshoeing, I was kinda in the middle of something else. The kids, too. I know… Excuses, excuses. We did receive our Ultralight Wiggy’s bags, via UPS. They’re still biggish/bulky for backpacking. (But not nearly as bulky as our Wiggy’s FTRSS bags.) We’ll give them a try, anyhow. I have to remember that we’re not Ultra-lite hikers. We’re combining backpacking with bugging out for our region. I need to repack and reassess my backpacking/bugout bag this coming week. We’ll do that on Sunday afternoon. I cleared a shelf off under a window in our hallway where I plan to start my seedlings in about two more weeks. Almond flour baking is a nice treat… infrequently. Seeds == including nuts and grains == carry the naturally-occurring pesticides called phytates or phytic acid. To dispel these, we soak the seeds overnight in clear water with a squeeze of lime juice or a splash of vinegar. Our preference is coconut vinegar. As far as we can research, the red ‘skins’ on almonds carry the phytic acids, so after soaking overnight, those are easily rubbed off. You know the difference between commercial almond meal with the red skins sprinkled through and blanched almond flour… a pale-tan lighter-feeling grind? If you folks are near a branch of NaturalGrocers, each store has a demo kitchen with classroom. The cooking and nutrition classes are all free, and they feed us, too! Occasionally, one of us feels the need for oatmeal in the morning. The night before, a serving is soaked in the weak acid I mentioned. By morning, the fluid is absorbed, shortening cooking time by nine-tenths. Oatmeal with coconut milk and raisins and crushed filberts… YUM! For a Keltic flair, try oatmeal with spiced ground lamb or venison. Cooking the mash in a sheep stomach is optional. When boiling down a chicken, I find it helpful to freeze a portion of the broth in ice cube trays then transfer the frozen cubes into a container kept in the freezer. Very easy way to add a cube or two when cooking various dishes. With the absolute frigid temperatures this week combined with a lighter rotc schedule (the school he is a crosstown student at was on break) I started fires both in the morning and when I returned home from work. Now we have a much better idea of how much wood we would really need to keep a fire going round the clock. (And, I supplemented with an electric closed oil heater at night since I have to go out to work early each morning.) What we totally ran out of was kindling. This winter has been very damp and we have used more kindling. We are pretty close on our newspaper as well. I fill empty dog food bags with fire starting stuff and store in the barn. I’ll look to double the amount we stock. Too cold for me to cross country ski for pleasure this week, but I did get the dogs out for a short hike a couple days. Being mid-way through life, we have started balancing on our Bosu ball. It strengthens those little muscles needed for balance and, if you do squats, some larger ones as well. I have a smaller, less expensive one to use at the cabin. Finally, we have a plethora of used bookstore one town away. I’m heading there to see if I can duplicate our gardening, homesteading and cookbooks to leave here at the cabin. Setting it up to be as turnkey ready as possible for any family who might need to be here suddenly. Question for the community…skunks live in our area, any thoughts on how to prevent them from moving in when we and our dogs are not here? Hasn’t been a problem yet; I’m bring proactive. I made excellent fire starters using dryer lint, put into egg carton depressions and fill with wax. When set cut them apart to make individual starters. They burn about 20 minutes, at least. Buy a Honda snowblower and never look back, our 9hp track model has preformed flawlessly for over a decade and when we retire to our long driveway place I plan to purchase the next size up though I would not have to. I have never been cold walking behind and steering the unit keeps you warm. We live in the mid-south and really hate it when it goes to 15° or 20°F because we have to replace the frozen water containers every day. We have heaters for the large stock water but all the rabbit and chicken water bottles/containers have to be replaced and the solid ice bottles brought in to thaw. Everything takes twice as long to accomplish. While the cold weather froze all the poop, now the rain will thaw it into mud poop. Welcome to the homestead!! The article on Time and Planning struck a note with me. I harvested hens which were not laying anymore and some roos. It doesn’t sound very time consuming when I say we harvested, butchered and processed chickens. But those who do it realize the amount of time involved. Just catching, killing and plucking or skinning them takes a couple of hours, depending on how many you’re harvesting. Processing 30 pds of chicken by pressure cooking, then de-boning, separating, spicing and canning in the pressure cooker takes a lot of time. Then, maybe I’ll freeze-dry some of that cooked chicken instead of canning it. Then there’s making broth and bone broth and canning that up. Not to mention the clean up and sterilizing everything afterwards. Yep, it takes time and planning! We made some progress here as well as had a setback too. First the setback, last Saturday while retrieving the last bale of grass/hay on the stack which was just out of safe reach i used the hay hook and snagged the bale by the twine and began to pull, unfortunately the twine broke sending me downward,ground-ward at a rapid descent all the while trying to maintain a vertical stance to no avail i tripped over my “miracle buckets” and using my hands to stop my fall i finally landed on the ground. My view from the ground to which i could clearly see, my nice 1A ladder to which i should have employed right from the start was still resting securely in it’s place, i then started to access the pain that was emitting from both wrists and what to do next. First thought that passed thru my mind was how i am always emphasizing safety with the wife due to the fact we are a min. of 40 minutes away from any type of emergency service and this day she happened to be in town at her ladies bible study. After a few minutes of rest and moving the wrists it was determined that nothing was broken but both hands took a beating as with the rest of the body. Needless to say had to tell the wife about the spill and how i could have prevented it Best to eat humble pie while it’s still warm. On a better note there is a hint of spring down here in SW. ID. and got out to do the annual fence mending, we have a combination of wood 3 rail fence and T post with live stock wire and although the wood 3 rail is very attractive it is a lot of maintenance. Began building a sheep shed this week too with left over building supplies that i had laying around the ranch and so far it looks like the only material i will need to buy is the sliding barn door hardware. A friend’s herd of Navajo Churro sheep is growing and she is willing to give us a few lambs to start our own herd. I would recommend you look into this breed if you are interested in sheep as they have some wonderful quality’s about them. One last note, the article posted last week on SB gave us some great insight into our Great Pyrenees and how he will interact with our soon to arrive sheep. “Best to eat humble pie when it is still warm.” Camp Doubt, that is a phrase I plan to use into the future. Especially with my sweet spouse. She appreciates her fella coming clean. I liked your comment about using the ski poles, fully concur. If you have the ability to use screw-on tips, try giving them double duty as “trek poles” for hiking in the summer. As I have gotten older, they really help me manage a heavier pack and I just don’t feel as beat up after a hike or portage. This week I attended the Sheepdog Seminar at Coeur d’Alene. Inspirational speakers included Greg Steven’s, the cop who permanently stopped 2 ISIS attackers in Garland, Texas in May 2015 which were armed with body armor and rifles, from 50-60 feet away, with his Glock 21 in .45 with 220grains. His 14 rounds vs enemy 30 rounds. I was partly ready to guard citizens before. I will be better in the future. We have a flat of tomato seeds and a flat of kale sprouting here. The heated growing box and grow lights will bring strong seedlings. Good eating awaits in midsummer. Hey Jim, although I believe the SCAR 17 is the current state of the art light weight battle rifle in .308, spare parts are another story. Due to the ease of building an AR 10 out of 80 percent lowers, and the easy part availability, I lean towards the AR 10. The only real draw back I have found are the problems with suppressing them (I have a trust and paid the tax stamp). They tend to start to have problems with extraction from over gassing and increased back pressure with a suppressor. The current crop of available adjustable gas blocks require an additional tool, and seem to lack the precise repeat-ability of a gas block on a piston rifle in the suppressed position. Any reader thoughts and comments would be appreciated. Hey Jim, one more question. If a person can so easily buy and make their own non serial numbered AR lowers, what would the advantage be of getting them from private sales with serial numbers? Because home-made guns can never be legally re-sold, even to a dealer. This all ties in to federal TAX law. An 80% build had no Federal manuafacturer’s tax due. A home build can only be given as a gift, within a family. Costco carries their brand of organic almond flour made from blanched almonds. Our household needs to be gluten free so we bake with it all the time. I’m eating a breakfast of almond flour pancakes as I write this. I think all almonds grown in California are sprayed with a chemical, similar to hydraulic fluid, to supposedly to kill salmonella which occurred several years back. The government is always looking out for us! So, blanched almonds or almonds from Europe or elsewhere are the way to go. Be happy to share several almond flour recipes and other info we have on gluten free diets. Hope this helps! Please do! My daughter has gone gluten free after a serious head injury ( I guess that is a common result). I’d love tried and true recipes using almond flour. Just about done reorganizing and cleaning indoors for this winter season. Now that we are getting up to 40 or so during the day, I need to head outdoors to clean up some of the things I didn’t get to in the fall. Also working to eat out of the freezers, like Lily. Early summer pea harvest will be here before we know it!